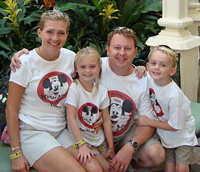 Tonia Drake Authorized Disney Vacation Planner - Disney Vacation Package Experts! As a family of four, Disney World is our favorite place! I would love to help you plan a stress free vacation to WDW. As Annual Pass holders we have visited around 100 days and have a wealth of information to share on hotels and restaurants. No matter the age, there is something for everyone! It never gets old walking up Main Street. That is always quite exciting for my family. You are never too young and never too old! I would love to help you create your dream vacation. Give me a chance to make your vacation magical! Ask for a free , no pressure, quote now!